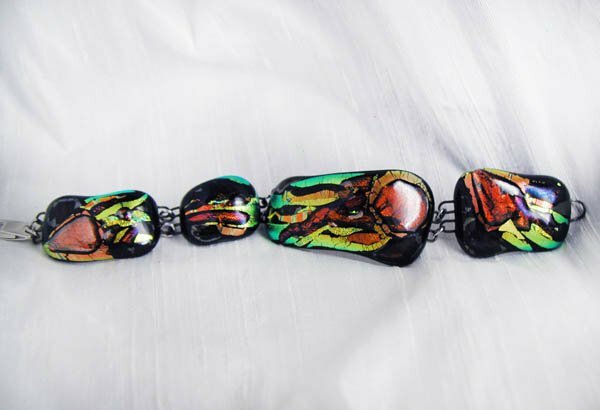 MY FULL SITE has closeup pictures of many of the bracelets; I will be adding more info ASAP. Feel free to email me or call me to get details on sizes and clasps available. 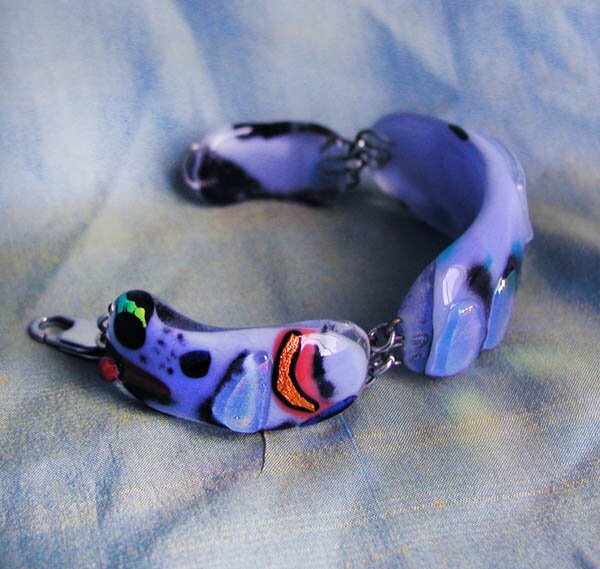 This Fierce Purple Dragon is a fused glass Creature Bracelets.She measures 7 3/8 inches long, and is 7/8 inches wide at her widest point. She closes with a square sterling lobster clasp. 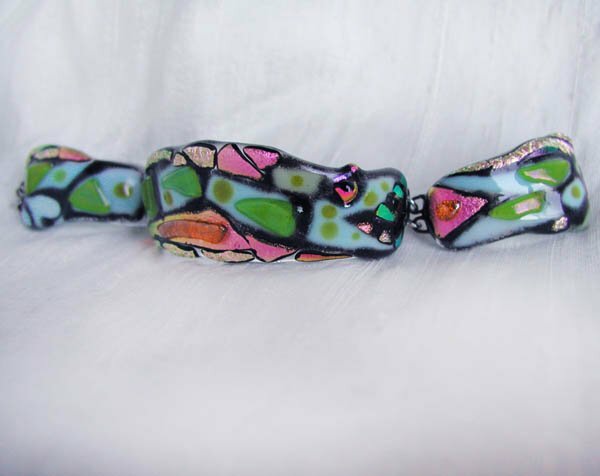 She is made with iridescent, dichroic and opaque glass on a clear, iridescent base. 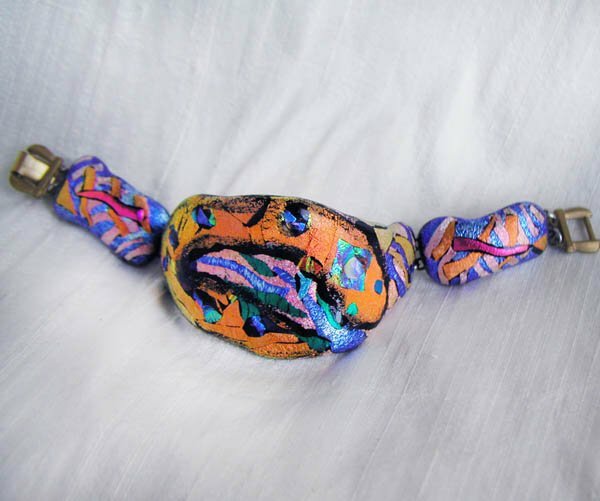 This is a fabulous wide snake bracelet, fit for an Egyptian princess. She is primarily a gold orange dichroic glass, with purple/turquoise eyes, and a pink, light river-blue background. There are good detail shots on my full site.She is 8 1/8 inches long, and 1 1/2 inches wide. She is closed with a raw brass steampunk fold over clasp, and a sterling silver safety chain, not shown. 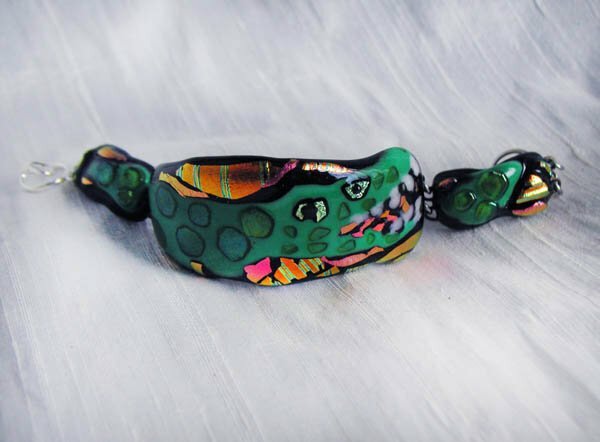 Mr. Alligator is a fused glass Creature Bracelets. He measures 6.5 inches long, and is 1 inch wide at his widest point. He closes with an sterling interlocking closure, and has a sterling silver safety chain, not shown. 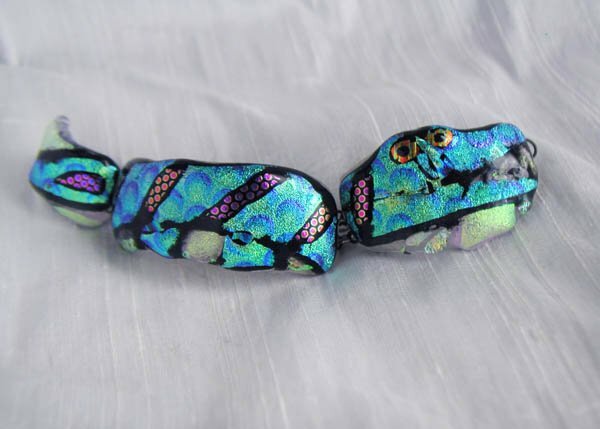 He is made with iridescent, dichroic and opaque glass on a black base. 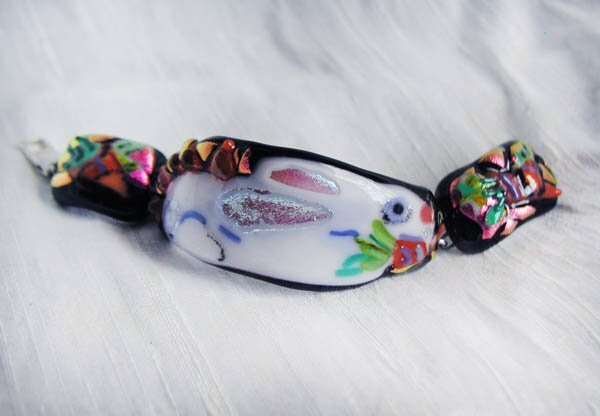 This sweet Bunny bracelet is created from a mixture of white and opalescent glass combined with orange iridescent carrots, and a dichroic iridescent magenta garden. 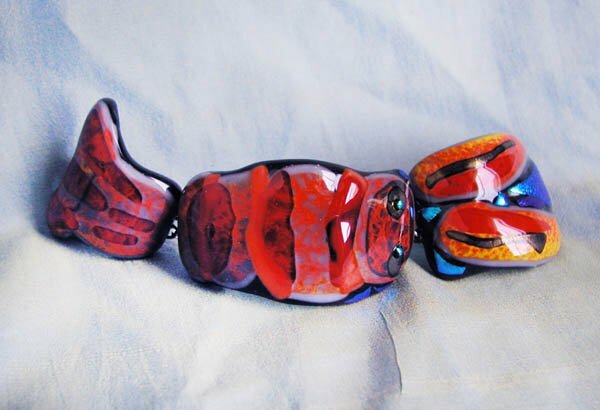 Bunny is 6 1/2 inches long, 1 1/8 inch wide, and is secured with a square sterling silver lobster clasp. 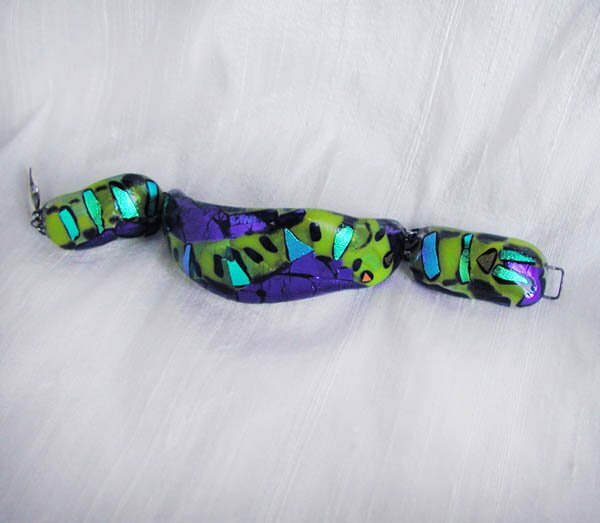 This fabulous and completely harmless snake bracelet is made from translucent lime green glass, with a dichroic iridescent deep purple backgroundThere are highlights in lightblue, blue-green and gold dichroic glass. The eyes are iridescent magenta. 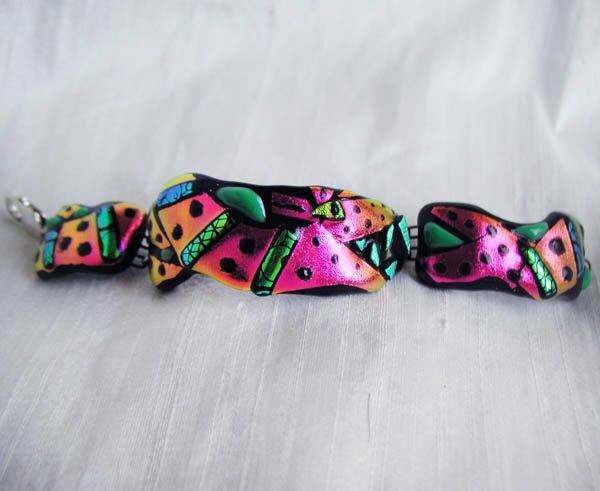 She is 7.5 inches long, 1 inch wide, and is secured with a square sterling silver lobster claw clasp. This is an odd little sea serpent, influenced somehow by tomato bugs, I think perhaps just in the bugged out pink and black eyes. The creature is blue with green spots, with some pink and orange highlights. 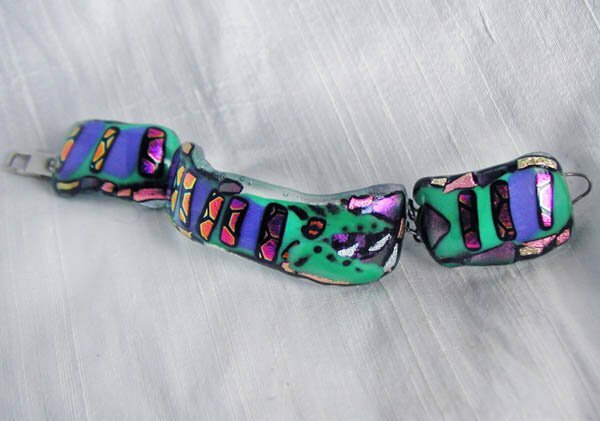 The length is 7 7/8 inches long and 1 inch wide. This weird guy with the iridescent green fangs is a joy to wear. 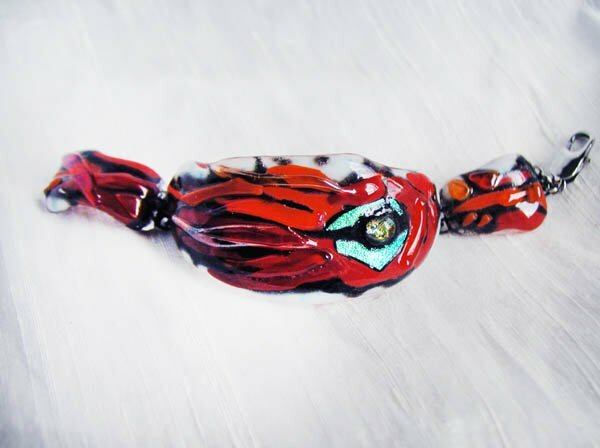 This spectacular red squid bracelet has an iridescent protruding eye. Did you know squids turn red when they "make love?" The squid is very dimensional, and at 7 inches long, 1 1/4 inches wide, she makes a fine cuff. She is secured with a stainless steel lobster clasp. 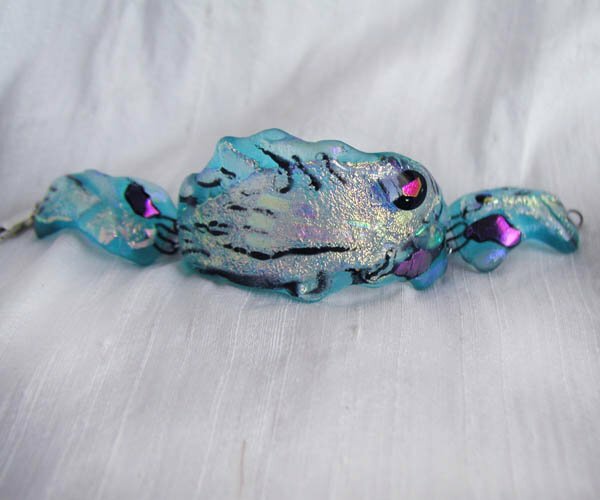 This jellyfish bracelet is very dimensional and glowing with dichroic glass. 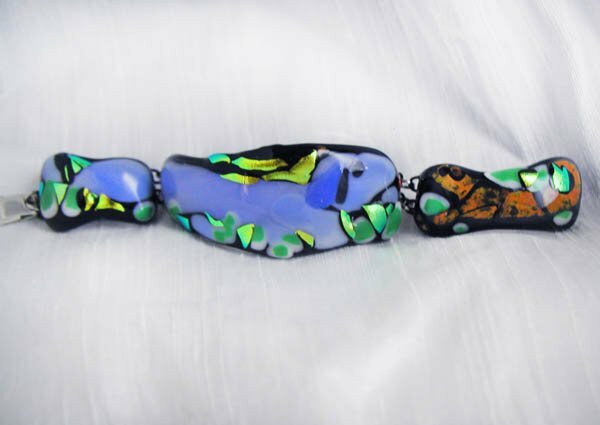 It is made from primarily iridescent glasses, both blue and transparent. 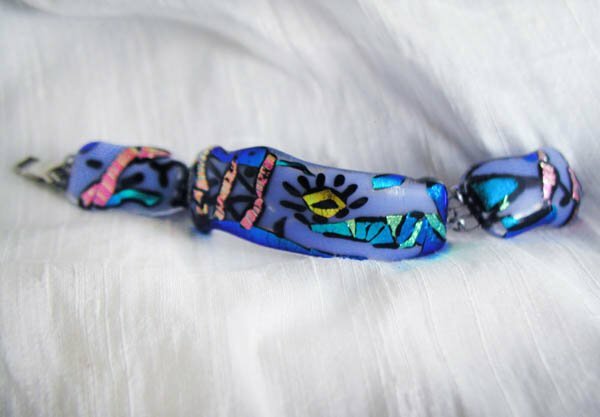 The design is almost abstract, but is clearly a jellyfish, with tentacles floating in the iridescent blue water. There are gold swirly water plant shapes in the background.. This jellyfish is 6 3/4 inches long and 3/4 inch wide. Blue Puppy is chasing a brown squirrel, round and round. 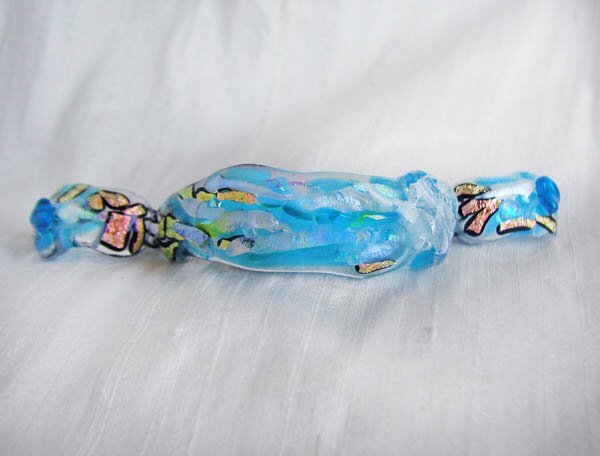 Created from dichroic and opaque glass on a black base, Blue Puppy is 6.75 inches long, 1 inch wide, and is secured with a stainless steel lobster claw clasp. If you go to my full website, you can see close up pictures of the squirrel.